Painter, graphic artist. Born into the family of a chaser, practiced this profession; member of the Union of Metal Workers (1918–1924). Served at the Ivanovo- Voznesensk ammunition depot and in the Red Army (1918–1921). 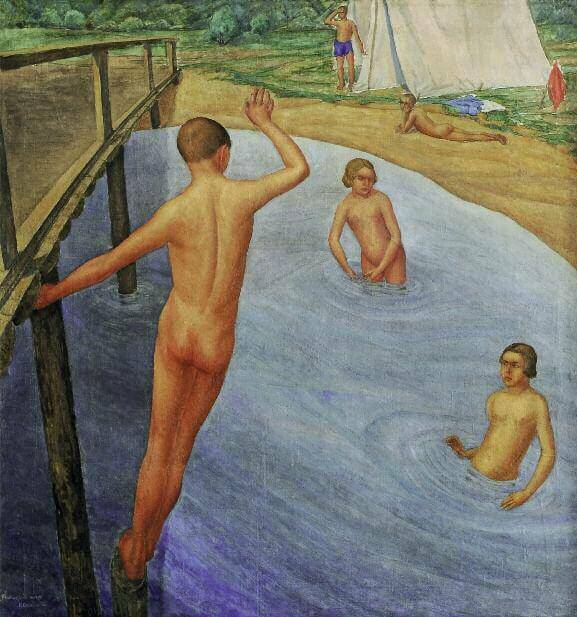 Studied at the Art and Industry Workshops in Ivanovo-Voznesensk (1921–1923); under Kuzma Petrov-Vodkin and Vasily Savinsky at VKhUTEMAS/VKhUTEIN (1923–1927, in 1924 changed the common course to the Easel Department of the Painting Faculty); diploma work Pioneer Camp study (Scientific and Research Museum of the Russian Academy of Arts), as well as thesis Landscapes by Alexander Ivanov recommended for publishing “after detailed workout”. After he received the title of painter returned to Ivanovo. Taught at the Mark Malyutin Art School in Ivanovo (1930–1946). Painted landscapes, still lifes, pictures dedicated to the life and work of Ivanovo textile workers, and portraits; created a series of paintings dedicated to history and revolution; contributed to Moscow and regional art exhibitions. In 1959, a solo exhibition dedicated to the 60th birthday of the artist.